Welp, football season has officially started, so it looks like I’m breaking out the pumpkin. I also drank tea this weekend. And took a bath. These are things I never ever do in the summer. I also ordered a couple sweater dresses online (which most likely won’t fit me) and brought a couple sweaters to the dry cleaners. I did some boot browsing and a little “fall cleaning.” I briefly thought about getting out my Halloween decorations (which consist mainly of glitter pumpkins) and bought my dog a ghost emoji toy at PetSmart. I am no longer in denial that summer is ending and I’m welcoming fall with open arms. My only wish is that the fall season will be kind to us and stick around for a good long while until the snow starts coming. If you really want to know the truth, I bought these Pumpkin Spice Cheerios the second I heard about them and this box is already completely gone. And if I’m being completely honest, I should probably tell you that since I couldn’t find them anywhere, I ended up just ordering them online from Target. And now that this box is gone and I still can’t find them anywhere, I’m considering placing anther order. It’s the second week of September; why are these not in my stores? In case you can’t tell, I’m a fan. I know it’s really not cool to like pumpkin spice anymore, but I don’t really care. I will probably always love pumpkin and fall spices and I don’t know why I feel the need to apologize for it. Why are you trying to make me feel shame?? I especially love it when it’s not too try-hard. You know, when it just works. 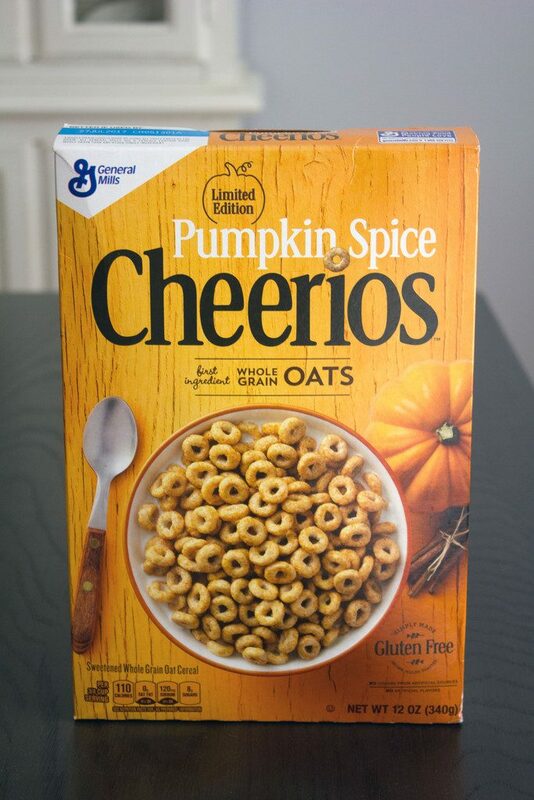 And pumpkin spice really just works in Cheerios. Plus, they’re made with real pumpkin puree and don’t have a fake taste to them. Perfect in a bowl with milk to start a cool fall morning. But even better mixed with marshmallows and white chocolate chips and made into marshmallow treats. Am I right? I wanted to do something fun with the Cheerios (other than mindlessly eating them all in a night) and marshmallow treats just felt right to me. I’ve actually never been a big Rice Krispies treats person. I really don’t know why, considering I love, love marshmallows and don’t have any problem whatsoever with Rice Krispies. They’ve just always tasted sort of empty to me and leave me feeling unsatisfied, like I need something more. I knew that making marshmallow treats with Pumpkin Spice Cheerios would not leave me unfulfilled. 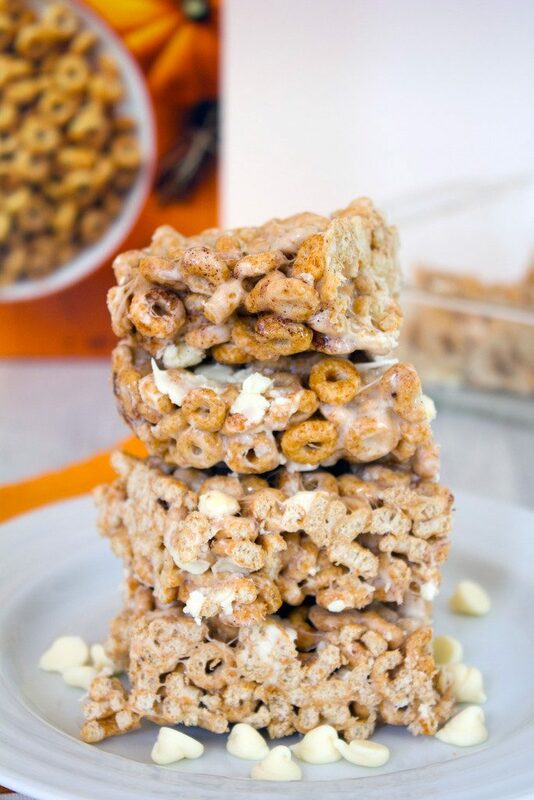 Why use Rice Krispies when you can use the amazingness that is Cheerios? I have no idea why some people make the choices they make. To be fair, not only did I mix Pumpkin Spice Cheerios and mini marshmallows together, but I also stirred in some cinnamon, nutmeg, ginger, and white chocolate chips. A dream team combination. 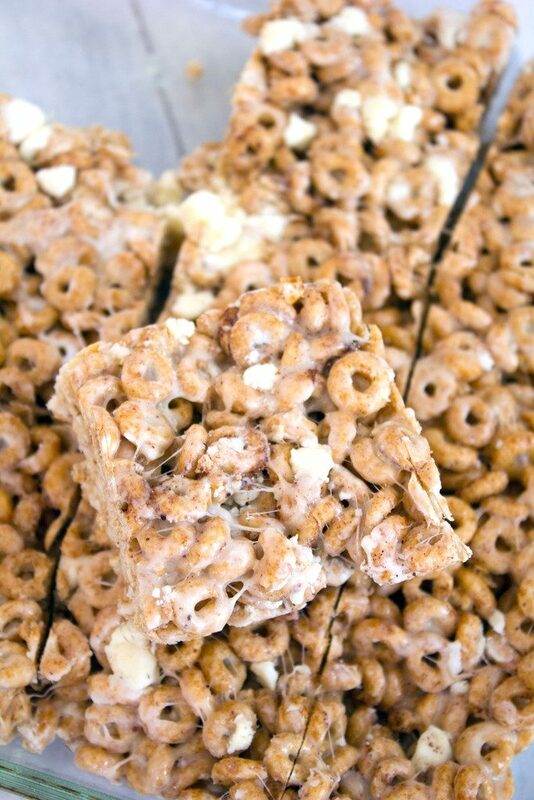 Do you know how easy cereal marshmallow treats are to make? Like, basically the easiest thing in the world. No matter they’re at every bake sale in the world that’s ever been in existence. And now they’re probably going to just live on my kitchen counter forever because I’m planning to keep eating them and making more, eating them and making more. Etc, etc. etc. I wish marshmallows had maybe a little bit less sugar in them because I kind of want to start eating these for breakfast. though I guess I’d probably have to leave out the white chocolate chips, too. And that would be a shame. Even if you’re feeling down on all things pumpkin spice this year, I still think you should give these a try. Let’s be honest, you probably just think you don’t like pumpkin spice because everyone is telling you not to and laughing at you when you pick up a product off the shelf. But who cares what they say. They just feel like they’re too cool to admit that they love the stuff, too. I mean, if I tried to hand you one of these, you wouldn’t take it? And you wouldn’t get at least a few little warm and fuzzy feelings when you walked into my kitchen and all smelled of pumpkin spice? Really?? What about if I handed you a pumpkin spice latte?? Just kidding… I’m actually not a fan of those. I much prefer a nice, strong cup of pumpkin spice flavored coffee. Though I’ve done a little shopping, I’m resisting actually wearing sweaters and boots until I absolutely have to. But I’m done resisting the pumpkin. You have officially been warned. But don’t worry; I’m not planning on going too overboard this year. After all, squash and apples and cranberries are making their way here, too. 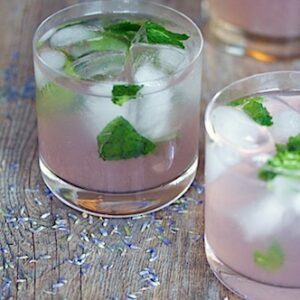 Who needs strawberries and corn and cherries, anyway??? (wahhh, I do. Summer, I will miss you dearly). Are you saying no to pumpkin spice this year or letting a little bit of it into your life? 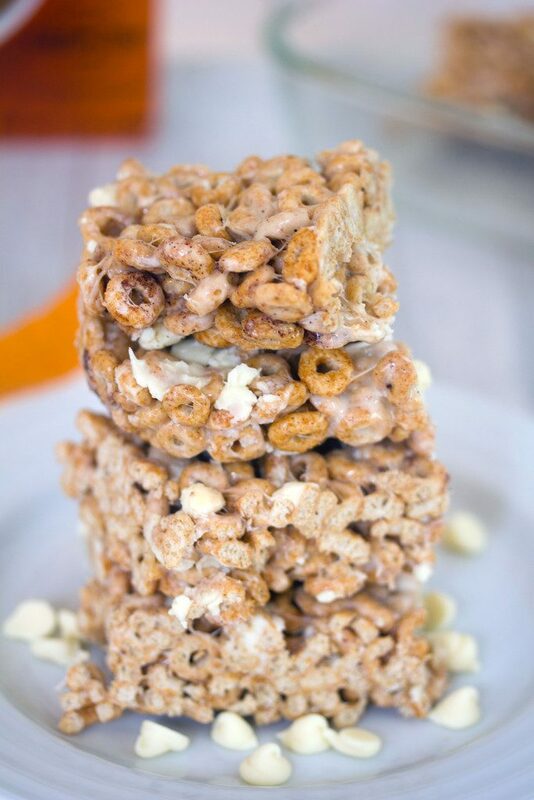 Fall is in the air and this spin on Rice Krispies treats is an easy-to-make seasonal treat perfect for a party or for gifting. 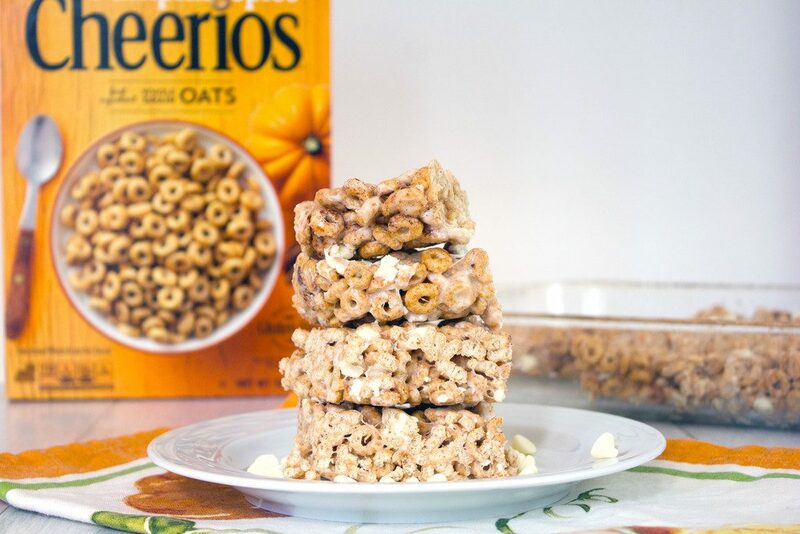 Pumpkin Spice Cheerios and marshmallows are a match made in heaven. Turn off heat and add in Pumpkin Spice Cheerios, cinnamon, nutmeg, and ginger. 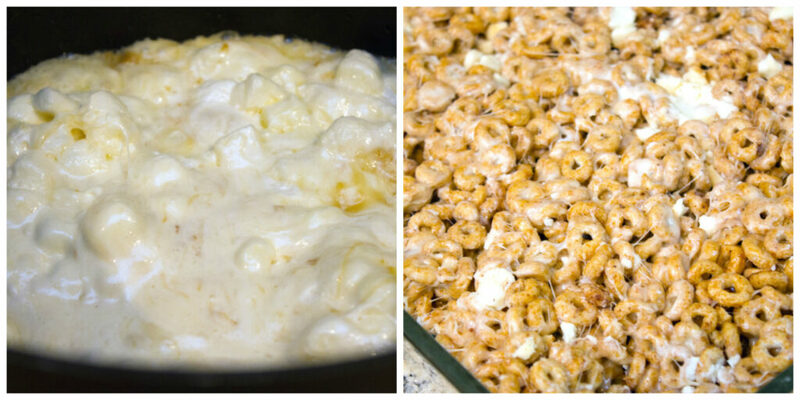 Stir until Cheerios are completed coated in marshmallow. Pour mixture into prepared baking dish and let sit for about an hour to cool and harden. 25 Responses to "Pumpkin Cheerios Marshmallow Treats"
I have been looking ALL over for these cherrios, Sues! These marshmallow treats are calling my name. I love this fall version! 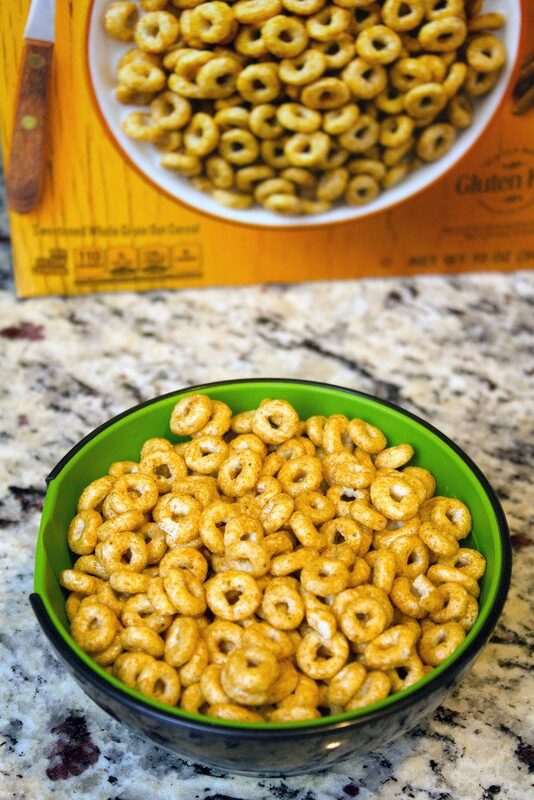 My goodness, I didn’t know that pumpkin Cheerios even existed! 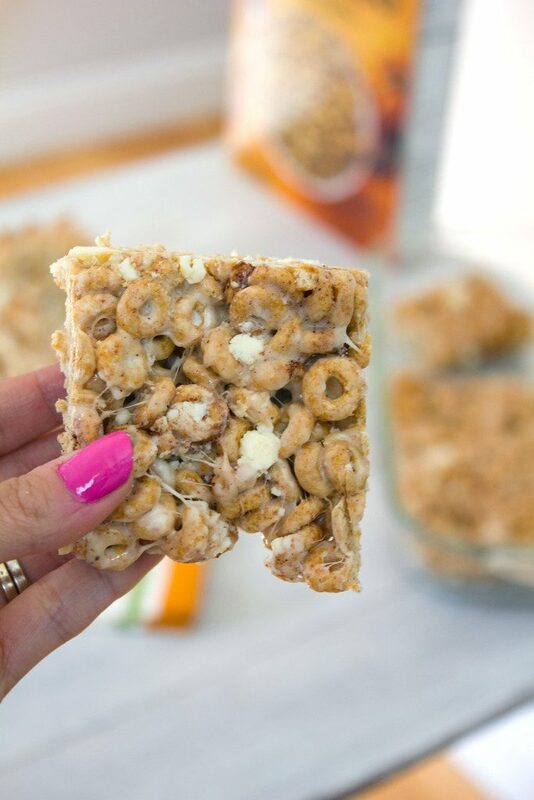 I definitely need to pick up a box soon to make these tasty bars. They are the perfect game day snack! I haven’t seen these Cheerios in stores and such a brilliant idea using them here instead of Rice Krispies. I completely know what you’re saying about the Rice Krispies, though. I’ve never really been inclined to eat them ’cause there’s just no substance to them really. No fill factor. I’ll have to keep a look out for the Cheerios so I can make these lovelies 🙂 Bring on the pumpkin! Lol, we are totally cut from the same cloth! I did almost the same exact things this weekend, minus the ghost emoji toy for the dog — I WANT ONE! And sweater dresses and boots – bring em on! 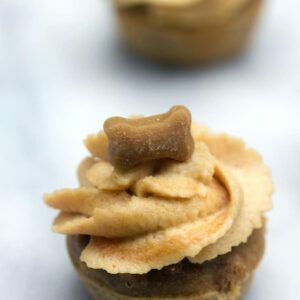 I’m finally embracing fall is happening too and I’m thinking these treats are the perfect way to celebrate! I used to loooooove cheerios, Sues! I haven’t had them in ages, so these are totally making me reminiscent of the good ‘ole days! 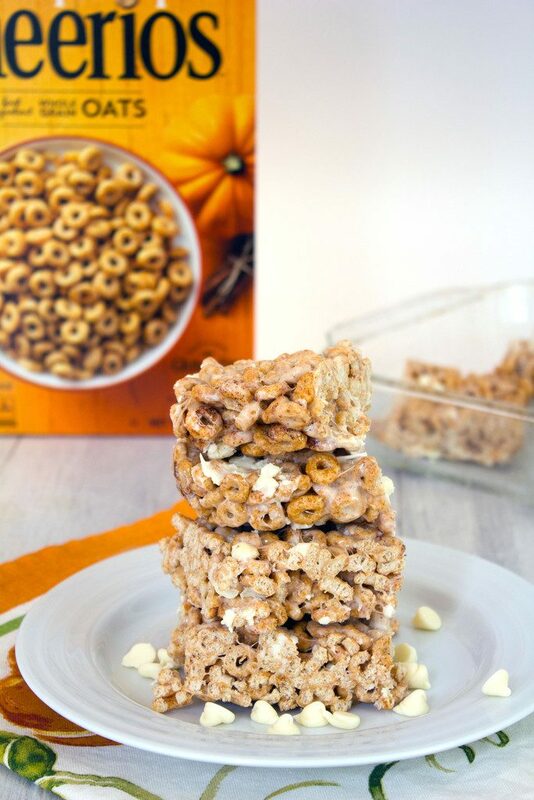 These pumpkin cheerio marshmallow treats look bomb! 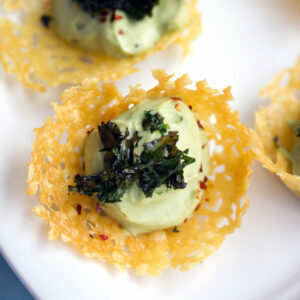 Totally trying these babies! Cheers! YUM! What a great idea. My kids would love these. These look like the perfect fall treat! I love that the Cheerios are made with actual pumpkin, too. When did it stop being cool to like pumpkin spice? Aaah. I missed that memo, and I’m glad. Because I don’t wanna stop loving all the treats, and this particular cereal treat is awesome! 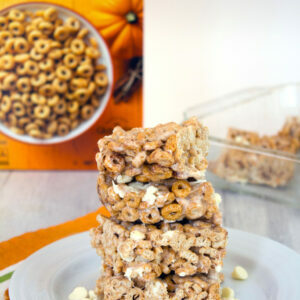 I need to get my hands on some pumpkin cheerios stat! I am absolutely delighted right now. I want to try this recipe with chocolate cheerios. Yum! You genius, you. These look WAY amazing (as do the PSCheerios on their own). Cannot WAIT to try these out! I have the pumpkin spice Cheerios and find they taste better straight out of the box rather than in milk. I was thinking of just following the Rice Krispy treat recipe but this looks better. I might add chopped pecans, too. By the way, a handful of these Cheerios also taste great tossed on top of a serving of cheesecake flavored pudding. 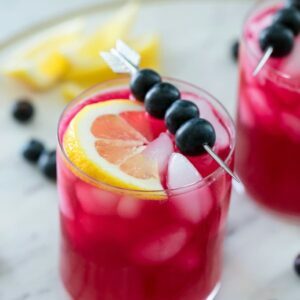 I found this recipe and was really excited!! !Went to my local Walmart and saw the pumpkin spice Cheerios and then got really really excited…told the gal at checkout what I was going to make and told her to go on Pinterest and look for the recipe. Wow…great minds really DO think alike! I, also bought these, and IMMEDIATELY thought they would be great to make cereal bars out of. Yes, I even added white chocolate chips! De-lish!! I went a little further, and made another batch with milk chocolate chips (because I LOVE pumpkin chocolate chip cookies Lol) ….which were also very tasty! I wish these Cheerios were sold YEAR ROUND! These sound really good. I’ve been wanting to make something with my pumpkin spice cheerios. I’m not a big fan of white chocolate though. Do you think darker chocolate would go with this recipe? Has anyone tried that? Or could you just leave them out and do a chocolate drizzle? I just made these but added some toasted chopped pecans and used sea salt caramel chips instead of white chocolate chips, love sweet and salty. Impatiently waiting for them to cool so I can eat some! @Soozin- I hope they were delicious! !